Welcome back, folks! Hope you had a wonderful weekend celebrating all the Big Poppas in your lives! This weekend I stumbled upon a little inspiration by way of Sir Richard Branson, whose penchant for friendly wagering once landed him on the cabin crew of an AirAsia flight serving cocktails in a skirt to Archbishop Desmond Tutu (who described him as “voluptuous”). In this short, entertaining read, the British magnate most known for his extreme adventuring and humanitarian efforts – oh, and the 400 companies he owns – talks about how a risk-taking attitude has been at the core of his biggest successes. Want to do great things? Take bets and break records, he says. 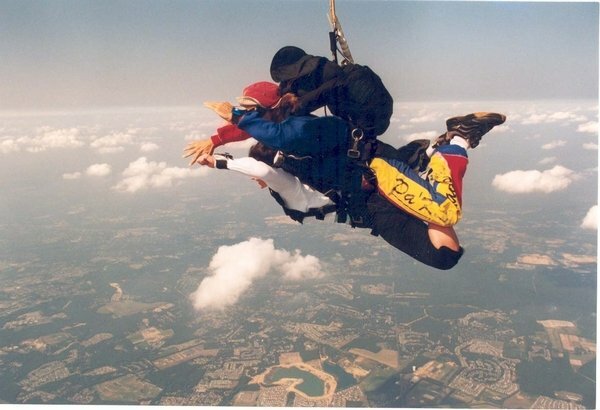 The last time I did anything like take a risk, I was 23 and jumped out of a plane (pictured above) with an instructor and a midget ninja on my back – that was the fun part before I dry-heaved. Dr. Seuss wrote “Green Eggs and Ham” on a $50 dare from his publisher that he couldn’t write a good story in 50 different words or less. So many of us never would have graduated Kindergarten without that book. George Lucas – so sure that his film “Star Wars” would tank at the box office – bet Steven Spielberg 2.5% of his profits for ALL TIME, if it did better than Spielberg’s “Close Encounters of the Third Kind.” Cue Spielberg laughing all the way to the bank. In 1872, after fighting two wars against each other, tensions between America and Great Britain were at an all-time high. Yankee Gilbert Bates bet his friends $1,000 that he could walk across GB wearing full military regalia waving the American flag and come home with nary a scratch on him. Not only did he return unharmed, he was welcomed with such open arms (London threw him a citywide party) that it precipitated a turning point in US-Anglo relations. We have him to thank for Downtown Abbey and Benedict Cumberbatch. What are some of the best bets you’ve ever made? Previous PostJunk Drawer: Week of June 17thNext PostI Need a Vacation (and it’s only Monday)! During a weekend in Chicago, not having finished a whole meal I bet the man, whom i had just met two days before, that I could eat this massively huge salad. He took me up on it but we didn’t set what would happen. I did finish the salad, with the help of another couple, bob and jean rosa. bob would occupy the guy while I shoved salad into jeans purse. The salad was gone. The guy asked ok, what do I have to do and I said marry me. And that is how you came to be. And the there is my bet at Belmont racetrack, horse macduff.